Delivered Cheyenne 26/4/43; Smoky Hill 6/5/43; Tinker 25/5/43; Smoky Hill 30/5/43; Dow Fd 6/6/43; Assigned 546BS/384BG [BK-V] Grafton Underwood 23/6/43; Missing in Action Schweinfurt 14/10/43 with Larry Keller, Co-pilot: Marion Odell, Navigator: Jerome Hart, Bombardier: Ken Gross, Flight engineer/top turret gunner: Virgilio Jacoby, Ball turret gunner: Harry McLean (6 Killed in Action), Radio Operator: Wallie Vansandt, Waist gunner: John Maloney, Waist gunner: Pete Motiaytis,Tail gunner: Chas Jellings (4 Prisoner of War); enemy aircraft, crashed Bischbrunn, near Markt Heidenfeldt, 18 miles W of Schweinfurt, Ger. Missing Air Crew Report 839. 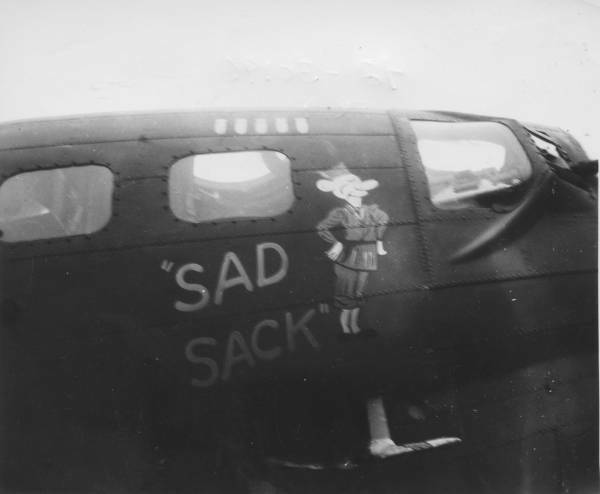 SAD SACK.